Buying or selling a vacation home is on your mind. You see an actor in a gold coat playing a real estate agent on TV. Do you think: I should hire one of those guys? Of course not. You think 'I want a local, independent real estate office". Local and independent means this company focuses their resources on the town that you're considering. Tech, marketing and charitable contributions are focused on the local community — the community where you want to buy or sell. And the other folks, no matter whether they wear gold or are part of a huge art auction house, take their marching orders from the national company. When you choose local and independent, resources are not sailing off to a national chain to make TV commercials that give you zero information about the knowledge and experience of the agents you might call if you dial the national number. Here's a couple of reasons why a local, independent real estate company serves you better. We, at Breckenridge Associates, designed our search technology for Summit County, as any smart independent firm's search should be targeted. For example, we made the search for "Ski In / Ski Out" a primary filter. When you need your search technology to work in every American city, that search tool might not deliver the information you want, first. You may have given up on a few national property search websites, for that very reason. I know I have. When I was looking for property in another town in Colorado, Google gave me some haughty national chain's site and offered me a property three hours away from the town I'd put into their search. And they have no idea that it's a 10 hour drive from here to there in the winter. We designed searches for people looking for property information in a recreation-driven mountain town. Like any good local, independent real estate company, our search lets you look for homes to buy, but we also let people who want to keep up with the market changes search for recently sold property. Our website is both sophisticated and rural. For nearly every subdivision and neighborhood in our town, we've written a guide to what local residents and paying guests like about each corner of the neighborhood. We have information for you about recycling, about septic systems and water wells, and our world-class cultural opportunities. We know hundreds of miles of local trails and public lands. Your property will not be lost in a national site with millions of other homes and lands that have no interest to the visitor to that Name Brand site. It will not be lost to that one visitor who will actually buy your property. And when someone does buy, they can call us to find the nearest, the best or the prettiest trails. Vested interest benefits buyers and sellers. Our business is a local business and we care about what happens to both the personal property we own and our town. Our investments have been more than just the homes where we live. 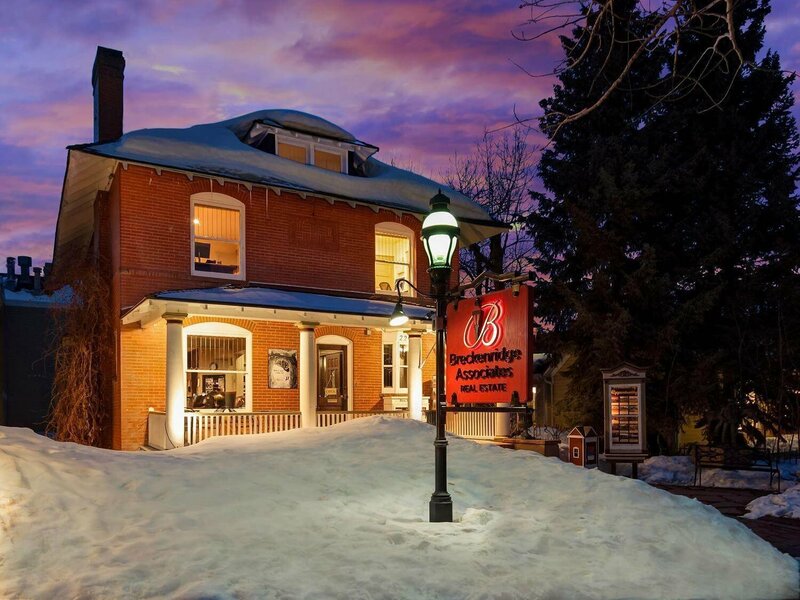 Our current office is an investment in Breckenridge's national historic district. 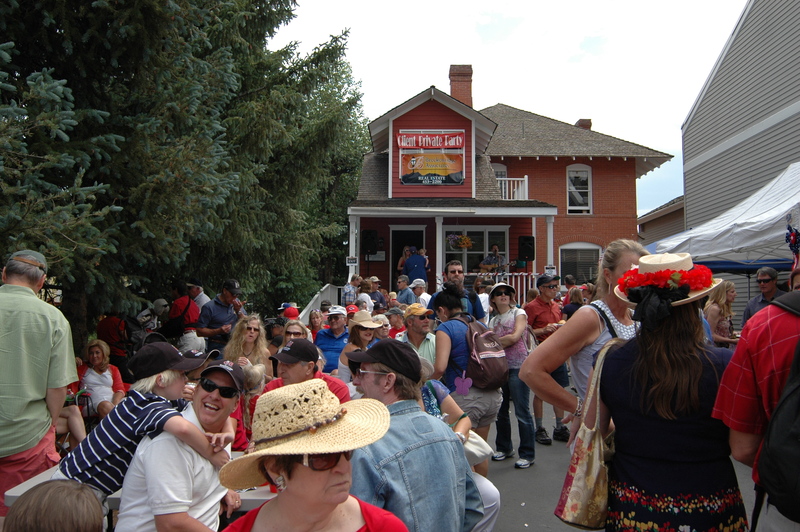 When our team of professional realtors bought it, the Old Red was one of the few remaining historic homes on Main Street. Property needs love and care, and we used our collective stores of it to restore this old brick house while keeping all its historic charm. Our home serves us well, as we help you find yours. Our charitable contributions are local, and people know of us because we sponsor kids making snow sculpture, local race team, the Breckenridge film fests, music, parties and other charities. But our contributions are more than just monetary. Just this year, Breckenridge was named a top small town for culture and Breckenridge Associates contributed to this achievement by supporting the Breckenridge Festival of Film from its very humble beginnings. Some of our realtors were the first snow sculptors in the state, and as a company we supported them to install the International Snow Sculpture Competition here in town, and continue to help it thrive. We have invested in the community just as we hope you will, or your buyer will. Our vested interest helps us understand your interests. Chain firms only care that you buy or sell with them. We care that you buy or sell here. Because we believe in Summit County and its environs. We know why it's great, and are not shy about sharing this info. We're also well aware of problems and are legally bound to report them to you. You win, even if you decide this community is not for you. If you choose one of the Breckenridge Associates you’re choosing the truly home town team. And one that guarantee world-class service. Breckenridge Associates Real Estate is a group of local independent brokers that survives next to firms that have massive television-ad dollars promoting their nationwide bland group. We're like the great restaurant that survives amid many franchises - it survives because it's so darn good. Not because its parent company has money to spend on empty marketing that gets it meaningless name in front of people. Some of our agents have been selling homes in Summit County since Jean Claude Killy was here promoting the Hinterthal. All of them, expect to be selling real estate in this town tomorrow and so they will do everything they can to make sure that you think Breckenridge Associates is the finest real estate company in Summit County, and local and independent.